On occasion, I get out of the office to visit with, observe, and interview people carrying on traditional arts practices around the state. 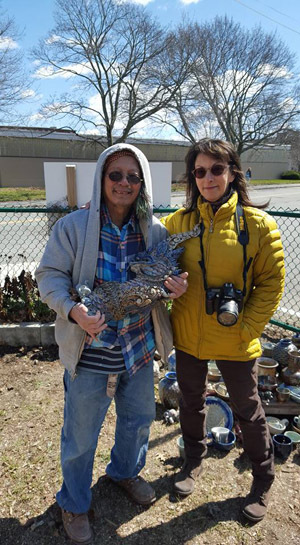 This time of year, it’s often to meet with craftspeople who will be demonstrating in the folk craft area of the Lowell Folk Festival. 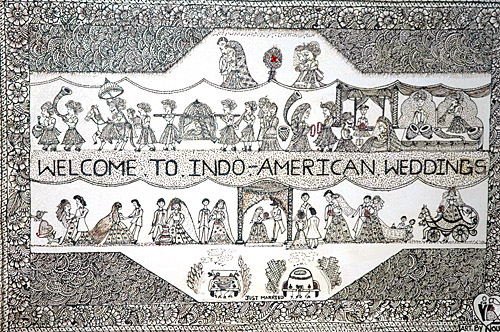 This was the case several weeks ago when my intern, Nora Martinez-Proctor, and I met with mehndi artist Noureen Sultana and her husband Waheed Khan. The couple, originally from Hyderabad, India, settled in the Metro Boston area in 2002. 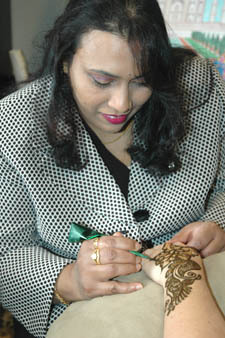 Noureen has built up a thriving henna business, providing beautification to approximately 85 brides per year. 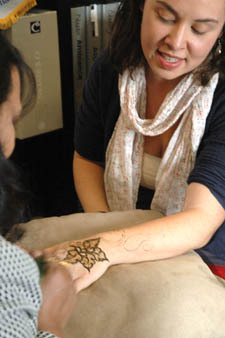 At the end of our interview, Noureen kindly offered to apply a unique henna design to each of us. A few weeks later, I headed to Lowell, Massachusetts, with several stops on the agenda. 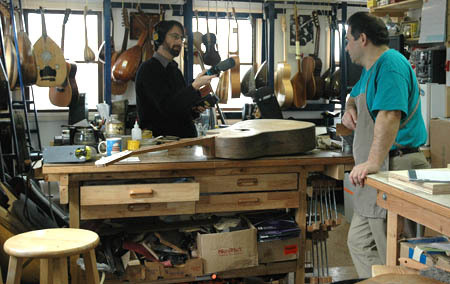 The first was to interview luthier Chris Pantazelos at his shop, Spartan Instruments. Adam Schutzman, who had asked if he could shadow me doing some fieldwork, met me there. A musician with many years of experience working with audio-visual archives and folkloric materials, Adam was right at home as we walked into Chris’ shop. So I put him to work. 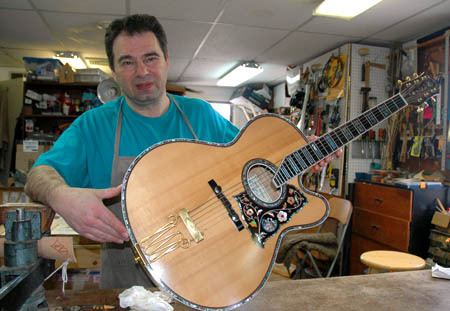 Chris opened Spartan Strings last year, after having spent 30 years working with National Heritage Fellow Peter Kyvelos at Unique Strings in Belmont. Chris currently has several building projects underway. 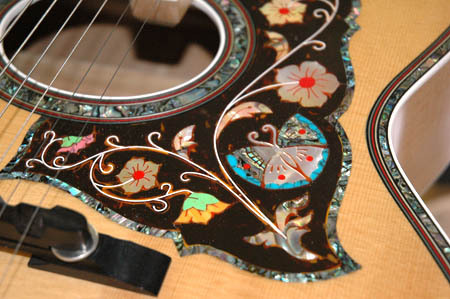 He recently finished this highly ornamented jazz guitar. In addition to interviewing Chris about his work in building and repairing stringed instruments, we talked about ideas for demonstrating at this summer’s Lowell Folk Festival craft area. Wouldn’t it be great to have a musician there to demonstrate the sound of various guitars, bouzoukis, and ouds? It was around noon when we left Spartan Instruments. I invited Adam to join me for a stopover at Ruben Arroco’s home. Ruben will also be demonstrating fruit carving in the folk craft area this summer. Back in 2013, Phil Lupsiewicz and I had interviewed Ruben in his kitchen, while he demonstrated his expert skills in carving fruit and vegetables. (Phil edited a short video, which you can find here.) Ever since, Ruben gave us a standing offer to come back for coffee and dessert. A treat that was hard to resist . . .
We arrived at Ruben’s home around 12:14 p.m.. He welcomed us in and we made our way into the dining area. 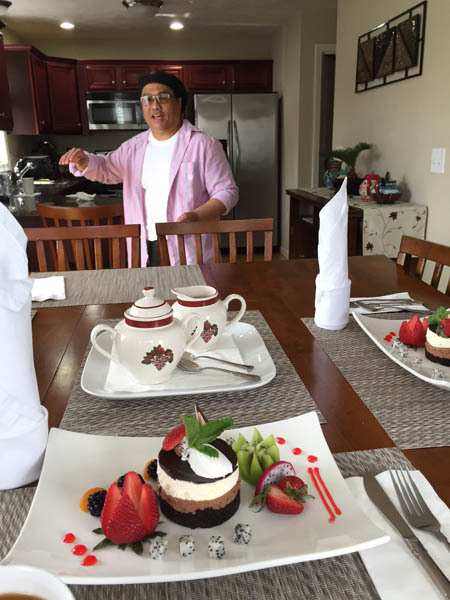 Ever the consummate host, Ruben brought out fresh brewed coffee and two plated desserts for us. The decadent mousse and cream cake was topped with fresh mint and surrounded by colorful cut fruit, including dragon fruit looking like wee dice. We talked about the growth of Ruben’s business, Culinary Arts, Inc, including his recent work in servicing local Cambodian weddings. We also learned that Ruben plays electric guitar and is a big Pink Floyd fan. The last stop of the day was serendipitous. 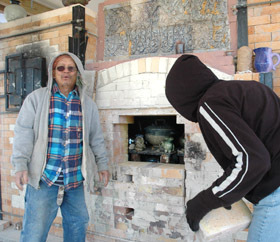 I had read that Yary Livan was going to be opening the wood fire kiln, which he and his students had fired a few days before. It takes a good 30 hours for the ware inside to cool down. 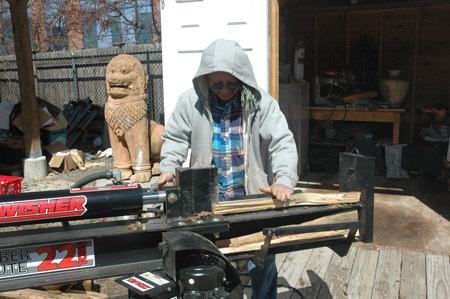 When I arrived around 1:30 p.m., Yary was operating the wood splitter. (OMG, be careful with those hands . . . ) Several students and fellow ceramicists were helping out carrying and stacking wood. 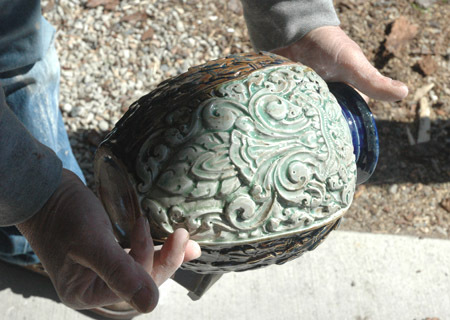 By 1:45 p.m., it was time to open the kiln. 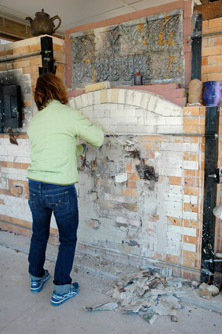 Diane peeled away the plastered paper and others took turns pulling out the bricks on the face of the kiln opening. 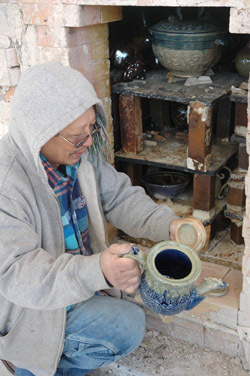 Kneeling beside the kiln, Yary carefully examined a teapot, and the glaze on a vase and a teapot. 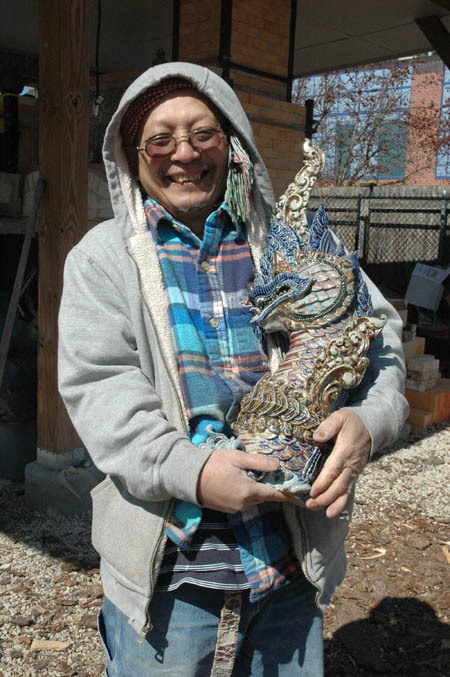 But the prize piece of the day was Yary’s naga, which he cradled in his arms. Not bad for a day in the life of a public folklorist.